50 meters from the sea, superb Bastide Aixoise on the WEST side of the Cap d'Antibes. Beautiffuly refurbished,this house offers spacious living room with central a fireplace. It has a fully fitted 'Boggenpohl' kitchen, 3 Bedrooms 'ensuite' and a smart independent studio for your friends. The swimming pool stands right in front of the property. There are a lot of various old trees and a large garage. We like staying here because - : It's close to the sea, there is a scubba club in the street. If this property looks interesting PLEASE CLICK HERE for a summary page about this properties for sale to BOOKMARK - ADD TO FAVOURITES - for future reference. It's printable so that you can show the family . . . If this property looks interesting PLEASE CLICK HERE for a summary page about this Cottage Villa for sale to BOOKMARK - ADD TO FAVOURITES - for future reference. It's printable so that you can show the family . . .
House built in the 1930's, completly renewed with brilliant and spacious rooms, Beautiful views of the sea and the Garoupe bay with its sheltered warm water. This villa was built at the time when Cap St Jean Ferrat and Cap d'Antibes were being opened up to the exclusive international set as a result of the popularity of the recently built railway along the coast of the South of France. The villas built then were in the best locations and had the best views, sunshine and shelter from winds. Meanwhile the Garoupe Bay here is especially prized by summer holiday makers for its warm and sheltered water - so you'll often find a few dozen of the worlds most desirable yachts anchoring in the bay and their occupants swimming into lunch at one of the wonderful Garoupe Beach restaurants. Villas here are perfect places to entertain freinds or impress business colleagues . . . so ownership by a company can be worthwhile and traditionally has enjoyed tax advantages. 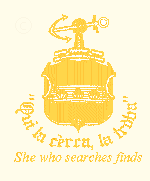 We like staying here because - : If you like a Mediterranean cruise but want to be on land, this is the villa to buy and enjoy for holidays or all the year round. Well located it's a good investment too! If this property looks interesting PLEASE CLICK HERE for a summary page about this Villa For sale to BOOKMARK - ADD TO FAVOURITES - for future reference. It's printable so that you can show the family . 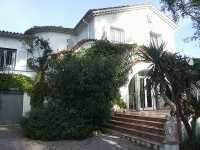 . .
South of the Cap d'Antibes peninsula 300 m², ground of 2500 m²lots of possibility. Very rare opportunity to buy a villa in a particularly unique and incomparable situation. If this property looks interesting PLEASE CLICK HERE for a summary page about this Exclusive Villa a vendre for sale to BOOKMARK - ADD TO FAVOURITES - for future reference. It's printable so that you can show the family . . . Situated on the east side of the Cap, you get morning sun in particular and you are sheltered from the westerly winds. 5 bedrooms 'ensuite' with caretaker apartment and heated swimming pool, barbecue area. We like staying here because - : the view is stupendous. This is one of the original private holiday villas built on the Cap and they were able to choose the very best location 40 years ago . . . so you can't find a better villa to buy than this one! Recently built, this house is in a very quiet area of the Cap d'Antibes with 4 bedrooms 'ensuite' with a spectacularly covered and heated swimming pool set in land of 1500 m². Covering the swimming pool lowers maintenance costs, keeping it cleaner and enables comfortable swimming all the year round. The South of France offers comfortable open air naked sun-bathing weather from the middle of April until mid November. The swimming season is shorter. 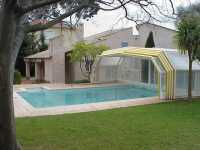 The covered pool here will extend your enjoyment of sun and swimming throughout the year. If this property looks interesting PLEASE CLICK HERE for a summary page about this world class villa with pool for sale to BOOKMARK - ADD TO FAVOURITES - for future reference. It's printable so that you can show the family . . . Within the M25 with easy access to London Gatwick Airport and train to London Victoria, this prestigious domain provides excellent facilities for an owner who requires staff. 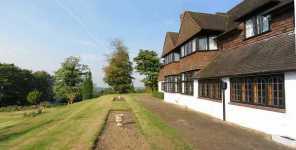 We like staying here because - : This house has fantastic views through wooded valleys overlooking London. It provides prestige accommodation with four staff cottages. The tennis lawn provides space for a helipad. If this property looks interesting PLEASE CLICK HERE for a summary page about this House and staff cottages for sale to BOOKMARK - ADD TO FAVOURITES - for future reference. It's printable so that you can show the family . . . Newly refurbished house waling distance from the sandy beaches of the Cap d'Antibes : . 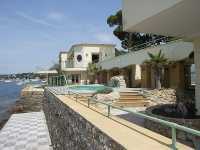 We like staying here because - : This area of the French Riviera is one of the most sought after places in the world !!!! If this property looks interesting PLEASE CLICK HERE for a summary page about this Exclusive property for sale to BOOKMARK - ADD TO FAVOURITES - for future reference. It's printable so that you can show the family . . .